At least a third of corals in the northern and central parts of the world’s largest coral reef system are perishing, scientists have said. Global warming and rising sea temperatures could be the culprits, they say. Researchers drew the conclusion based on data from aerial and underwater surveys after the bleaching became evident in March this year. 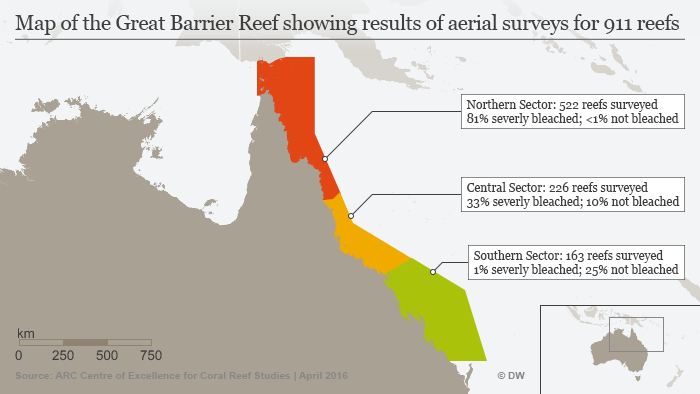 “We found on average, that 35 percent of the corals are now dead or dying on 84 reefs that we surveyed along the northern and central sections of the Great Barrier Reef, between Townsville and Papua New Guinea,” Terry Hughes, director of the ARC Centre of Excellence for Coral Reef Studies, James Cook University, said in a statement. “This is the third time in 18 years that the Great Barrier Reef has experienced mass bleaching due to global warming, and the current event is much more extreme than we’ve measured before,” Hughes said. Bleaching occurs when abnormal conditions, including warmer sea temperatures, trigger corals to release tiny photosynthetic algae. This drains the organisms of their color and affects their ability to reproduce. According to the statement, corals off Australia’s west coast have been severely damaged, with “extensive and patchy” bleaching and mortality. “On the Kimberley coast… up to 80 percent of the corals are severely bleached and at least 15 percent have died already,” researchers said. He said it would be at least a decade before the coral cover would be back, but it would take much longer to regain the oldest and largest corals. The findings come shortly after Australia’s environment ministry was criticized for pressuring the UN to omit the Reef from its World Heritage and Tourism Challenge report. The 2,300-kilometer-long Great Barrier Reef is the world’s largest coral reef system and its largest living structure. It has been negatively affected by farming run-off, climate change, development and crown-of-thorns starfish, which feast on the corals. Australia is still heavily dependent upon coal for meeting its energy needs and continues to support fossil fuel projects despite pledges to cut carbon emissions. The country recently awarded leases to India-based Adani Enterprises for a $16.7 billion (15 billion-euro) coal mining project near the coral system.